As part of our commitment to a professional clinical service, our clinical staff receive professional training and refresher courses throughout the year as part of their CPD. This gives our clinical staff the opportunity to enhance and develop their knowledge and understanding of complex posture and clinical assessment. It also allows them to discuss unique situations and solutions for complex client needs. Following on from hosting the Oxford 4 day Training Course, “Posture Management for Adults and Children with Complex Disabilities”. In July this year SOS in conjunction with the Oxford team held a special 2 day training session specifically for our Clinical Staff. The 2 days were structured around both theoretical and applied sessions providing an overview to the posture management of people with complex disabilities. 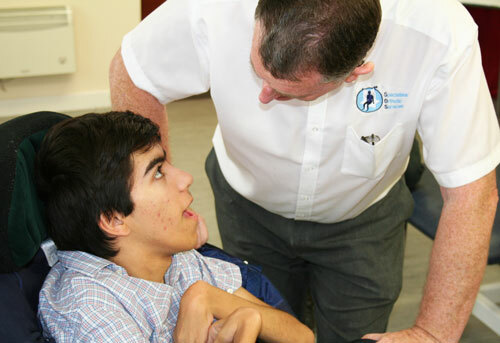 Effective Postural Assessment is essential in order to optimise remaining functional ability and minimise secondary complications associated with adults and children who have complex disabilities. The 2 day course was led by Pat Postill Physiotherapist (NOC) from the Oxford team. Pat Posthill and Wendy Murphy have been responsible for development of the Oxford complex posture training courses which have now become established throughout the UK. The training was based around 2 parts. Physical Assessment and the Casting Technique used to create the model for final product. The clients were assessed in supine (lying on their back) and sitting. Joint ranges were measured, particularly noting any restrictions and fixed deformities. These measurements informed us of the critical measures that needed to be accommodated in the casting bag. E.g. Kendal’s hip position and Taz’s spinal position. In order to create a cast for custom seating SOS use well established vacuum consolidation techniques. This process is essential for customised seating. It allows us to capture the client’s posture and create an accurate model for the seat to achieve maximum comfort whilst enabling function. The VC Bag acts as a temporary seat and the client is given some time to sit to make sure they are comfortable. The process of fine tuning the position of the client is now done to achieve the optimum posture for that client, paying attention to the critical measures established in the physical assessment process. Once the desired position is achieved the client is then removed from the bag. This allows us to make an exact imprint of the optimum position for the custom seat unit for that particular client. Once the client has been taken out of the bag a plaster model is created from the impression left in the VC Bag. This plaster model forms the basis for the customized seat throughout the manufacturing process. 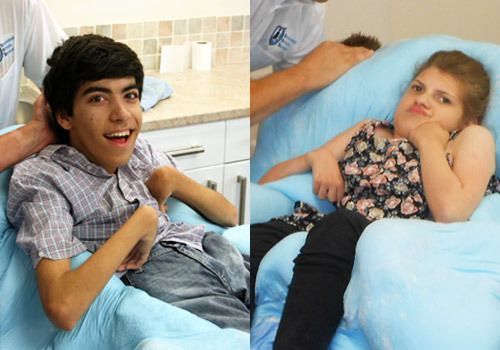 By maintaining effective progressive training for our clinic staff SOS aim to provide the best possible seating service. This is only possible by investing in our staff and making sure they have the experience training and therefore expertise, to deliver to our customers. Further training sessions are planned for 2015. Murtaza ‘Taz’ Raza and Gordon McQuilton MBE, Managing Director. We would like to thank Murtaza ‘Taz’ Raza and Kendall Thompson for being fantastic volunteers and taking part in the training event. If you have any questions or would like to know more please contact us.